SKB 2SKBSC4117 Hybrid PL Bow Case 600D Nylon Soft Black 39 x 15 in. x 5 in. in. The PL Hybrid Bow Soft Case is manufactured of a rugged 600 Denier ballistic nylon with a durable double zipper pull closure and padlock loops. It utilizes an external pouch for organized accessory storage and adjustable padded shoulder strap for a hands free transport when needed. 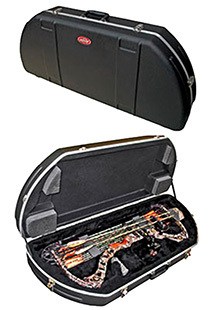 The interior of this hybrid case will accommodate a bow and arrow storage in the lid. It exterior dimensions are 39 x 15" x 5".This model has a black finish."